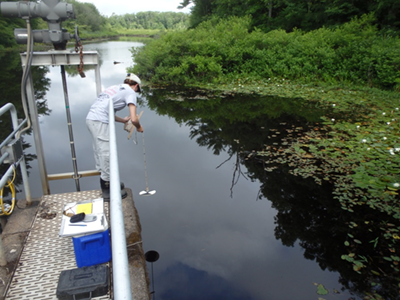 EcoLogic is working with the Hyannis office of GHD to evaluate water quality conditions and potential sources of contamination in the public water supply reservoirs serving coastal Cohasset, MA. Our aquatic scientists Kurt Jirka and Eileen Randall engaged with students and teachers from the Cohasset Center for Student Coastal Research to train volunteer monitors. The students sampled multiple locations within the reservoir watershed over the summer to look for evidence of wastewater seepage affecting the streams and ponds. This was a cost-effective (and fun) approach to collecting lots of samples and mentoring the next generation.